The Roman Catholic Church celebrates the Feast of the Holy Name of Mary, on September 12th in honor to the name of Mary, the mother of Jesus. This feast day has been celebrated since 1684 when Pope Innocent XI officially included it in General Roman calendar, but actually dates back to 1513 as local celebrations were held in Spain. The entry in the Roman Martyrology about the feast speaks of it in the following terms, “The Holy Name of the Blessed Virgin Mary, a day on which the inexpressible love of the Mother of God for her Holy Child is recalled, and the eyes of the faithful are directed to the figure of the Mother of the Redeemer, for them to invoke with devotion”. Before the Battle of Vienna in 1683, John III Sobieski placed his troops under the protection of the Blessed Virgin Mary. In the following year, to celebrate the victory, Pope Innocent XI inserted the feast into the General Roman Calendar, assigning to it the Sunday within the octave of the Nativity of Mary, which falls on September 8th. To honor the name of Mary, this Blessed Virgin Mary, Mother of Jesus our Savior – we continue the tradition set many centuries ago, by our forefathers. 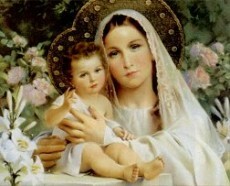 There is wisdom in honoring the mother of Jesus, the virgin named Mary – as she is our spiritual mother as well. She will lead you to her Son.